24th match of ICC Worldcup 2015 has been played between Ireland and South Africa at MAnuka Oval, Canberra today. South Africa with splendid batting performances managed to put 2nd consecutive time 400 plus runs ie. 411/4 runs for opposiion to chase. Ireland needed 412 runs to win the match. HM Alma's superb 159 and F de Plessis 109 from the top led South Africa to put very huge totals at Canberra. Ireland team all out scoring 210 runs and lost the match by 201 runs. HM Amla (South Africa) declared man of the match for his 159 runs. Earlier, South Africa won the toss and decided to bat first. Opting to bat first South Africa Q de Kock early. 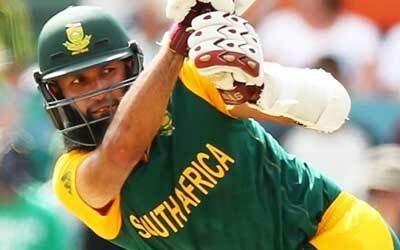 But, F de Plessis 109 and HM Amla's superb 159 runs helps South Africa to put hue totals of 411 runs. Other middle order bastmen also performed well and contributed quick runs for South Africa. Following very huge totals of 412 runs, Ireland lost top 5 wickets just in 48 runs. O'braine brothers took the charge in hand played good innings for Ireland. A Balbirnie made 58 runs and KJ O'Brien also played good cricket and contributed 48 runs but not enough to reach very huge target of 412 runs. Ireland team all out scoring 210 runs and lost the match by huge margins of 201 runs.